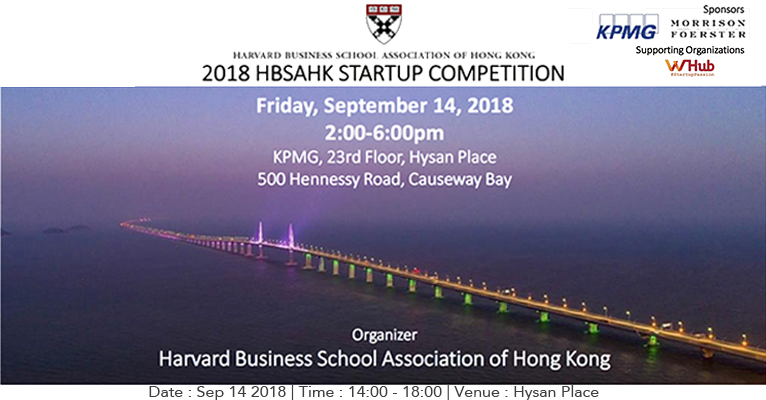 Harvard Business School Association of Hong Kong (HBSAHK) is pleased to present its fourth annual startup competition in partnership with the leading local incubators and accelerators in Greater Hong Kong. Our competition event will spotlight the most promising startups from the Greater Hong Kong startup ecosystem. Come see some of the most innovative startups in Asia as they pitch their ideas, business models and dreams of changing the world! We will select 4 finalists at the end of the competition based on an audience vote. The finalists will go on to compete for the title of HBSAHK Startup of Year at our annual HBSAHK Signature Conference in January 2019. RSVP: Places are limited and will be allocated on a first come first served basis. Reservation is by payment of non-refundable event fee. This is a private event, and participants are requested to respect the confidentiality of the views and opinions expressed.